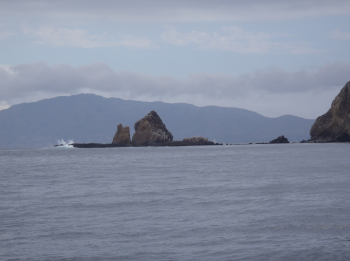 Cat Rock, Anacapa Island is located offshore on the south side of West Anacapa. The 81-foot peak of the rock was used as a survey point in 1933 by C. K. Greene who did not mark the point. Today it is a popular dive spot. Feral cats once preyed on nesting sea birds, presumably resulting in the name, Cat Rock. It is accessible at low tide. Cat Rock is one of several sites at Anacapa where giant black sea bass are often seen. They were reduced to near extinction from over fishing and incidental catch in gill nets, which are now illegal within a mile of the shore. This page was last edited on 16 April 2016, at 15:55.